Isle of Wight Festival to be screened in 3D on Sky | What Hi-Fi? 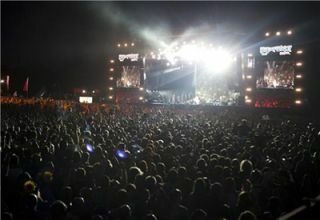 The Isle of Wight Festival is to be the first UK music event to be broadcast live in 3D, reports the BBC. The three-day event, which is celebrating its 10th anniversary this year, takes place between June 10 and 12 at Seaclose Park, Newport. It will be broadcast on Sky's 3D channel and Sky Arts. The channels will simulcast live for two hours a day throughout the weekend, taking in the biggest acts and headlines from the Main Stage and Big Top. The Kings of Leon, Foo Fighters, Pulp and Kasabian are among the headline acts booked for the festival. Bestival, which will be held on the island in September, will also be broadcast in 3D on Sky. Festival promoter John Giddings, of Solo Music Agency, says: "It is incredibly exciting for our 10th anniversary to be at the forefront of television broadcasting in the 21st Century." Check out the Isle of Wight Festival website for more details.